Leslie Basham: As a wife, Shannon Popkin, faces a lot of temptation to control her husband, but she’s discovered the joy of giving up that control to the Lord. Shannon Popkin: God has blessed me every time that I let my husband lead, every time that I choose to surrender. God shaped my heart, and He gave me contentment. And that’s what He does when we surrender to Him. Leslie: This is Revive Our Hearts with Nancy DeMoss Wolgemuth, author of Surrender: The Heart God Controls, for Thursday, September 28, 2017. Nancy DeMoss Wolgemuth: Well, we’re talking about a topic this week that I think maybe every one of us as women, men also—I don’t want to leave them out . . . But I think as women, we wrestle with this in varying ways, varying degrees. It’s this whole issue of wanting to control our circumstances—the people, the situations around us, the outcome of our lives, to fix everything, to make it right. We’re talking with our guest, Shannon Popkin, who has written a book that has been very helpful to me, and I think it will be to many other women as well. It’s called, simply, Control Girl. Maybe when you hear that you’re thinking, That’s somebody else I know. That’s not me. I think as you start to read and think about it, you may realize there’s more inside of us of this control girl than we realize. Now, let me just mention the book, which is available today as our way of saying “thank you” for your donation of any amount to the ministry of Revive Our Hearts. We’re trying to help women experience freedom and fullness and fruitfulness in Christ and to be free from burdens like the burden to control the whole world. As you support this ministry, you’re going to be helping other women experience that. 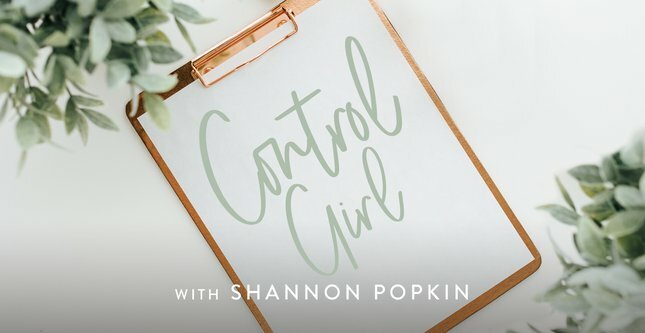 This book, Control Girl by Shannon Popkin, is our way of saying “thank you” for your gift today. Control really is a burden when we feel like it all falls on us, isn’t it? Nancy: And you’ve talked about some lessons on surrendering your burden of control based on what you’ve learned from seven women in the Bible. Nancy: There’s lots more we could learn about these women. These are just vignettes. Nancy: You talk about seven of those women, and we’re going to look at one of them today and another one tomorrow. But I want to go back to a situation you describe. I thought it was very poignant. I heard you describe about when you were sitting in a Bible study with a group of women, and you asked them for the burdens that were on their heart. Tell us what they shared and how that impacted you. Shannon: I asked them if they would share a prayer request related to a relationship struggle they were having. I thought maybe we would hear about some parenting struggles or marriage, but, instead, every single woman around the table that day shared about a very controlling mom or a very controlling mother-in-law. As they were talking, I sensed that God was saying something to me because I had begun to think about my own control issues and see how the tension that my desire for control was creating. But I had been thinking of it in the short-term. I had been thinking about how it was affecting my relationships right then, right now. I wasn’t thinking about it in the long-term. I wasn’t thinking about how this would affect who I would become and affect the long-term relationships in my extended family. After the women shared that day, I leaned into the table, and I said, “You guys, how do we make sure that we don’t become them? We’ve just heard all of these stories about these women who . . . I don’t think they were intending to be a burden. I don’t think they’re trying to create tension and turmoil in their relationships. And yet, their desire for control is like a burden on the shoulders of their daughters and their daughters-in-law. How do we make sure that we don’t become them? Nancy: Twenty years from now, so it’s not our daughters who are giving these prayer requests. Shannon: Yes, exactly. How do we make sure that that doesn’t happen? I don’t think anybody intends to become that, but I’m convinced that if I just give full vent to this desire for control that wells up inside of me, that is who I will become. It’s kind of inevitable. I think it’s just this problem that metastasizes slowly over time without us even recognizing it. Unless we consciously choose to take a different path, to choose surrender, I think that over time, this is what happens: We do become more and more controlling. God just lets us take our own path of selfishness. Nancy: Which is the worst thing that could happen to us, for God to just let us go on in that pathway. Nancy: And for years, you didn’t really think of control issues as your struggle. You identified, for example, with an issue with anger. Nancy: And you didn’t see the connection between that and control. How did that start to become clear to you? Shannon: I think anger was the main thing I was thinking about. I was reading books about anger and asking friends to pray for me. One day I was driving in the car listening to the radio, and a woman was talking about how there are these surface-level sins—like anger or anxiety or fear or perfectionism—that are readily apparent. We can see those in our hearts. Then she talked about sometimes there’s a deeper core sin, a deeply rooted sin that’s feeding these other sins. Nancy: But maybe not as easy to identify. Shannon: Yes. Not as easy to identify. And she mentioned the sin of control. And in an instant, I knew that was my problem, that my anger was stemming from this desire, this deep-seated desire for control. So I learned to start asking myself these questions to connect those two, because it was very easy for me to see my anger. When I feel the anger rising, or the anxiety rising, or these other negative emotions, I started asking, "Is there something I’m trying to control here?" Shannon: Or someone, yes. Or, "Do I feel like I’m losing control of someone or a situation?" More often than not, yes, control was at the root. It was the core issue. Until I started dealing with the control, I was not able to get traction with my anger. So I just invite women to start looking at those emotions that bubble to the surface and ask: Could control be this deeper-seated issue that’s feeding these other issues that are easier to see? Now, when we start talking about this thing of control, especially in parenting and in the home and the work place, it could sound like we’re saying you’re just supposed to be irresponsible and let everything go, que sera, sera. That’s not what you’re saying. That’s not what God’s Word is saying. You talk about a principle that you learned from another writer who wrote a parenting book that’s been helpful to you. I thought it was helpful as I read it. You talk about two different kinds of problems. Nancy: Why don’t you explain it? Shannon: Sure. I’m referring to Dr. Tim Sanford who wrote a book called Losing Control and Liking It. It’s a parenting book. He divides all of life into two categories: on one side of the line are the things I can control, and on the other side of the line is everything else. Nancy: And so you identify what you can control and what you can’t control. And then how do you handle those two different situations? Shannon: Dr. Sanford suggests a response of holds. Picture cupping your hands and holding responsibility for yourself and the category of what I can control. And on the other side, with all the things I can’t control, picture folding your hands in surrender and prayer and giving God all of those things we can’t control. What I’ve learned about myself and other control girls is we tend to do exactly the opposite. Rather than folding our hands in surrender, we try to grab control. We try to grip control and get it into our own hands. Nancy: We feel we’re losing it or something we can’t control. Shannon: Yes, absolutely. And then with ourselves, on this other side of the line, rather than holding control of ourselves . . .
Shannon: Yes, we tend to fling that out the window. We lose control of ourselves, especially in the area of anger and anxiety. We don’t have control over ourselves. So there’s some irony there. Rather than taking control for ourselves, which we could do, we’re losing control of ourselves, and we’re trying to control the very things we cannot control. Nancy: And that really requires changing the way we think because our behavior’s not going to change. Our anger or our anxiety, the things that flow out of trying to control things we can’t control, we’re not going to be able to change that if we don’t change the way we think. How have you seen God bring that kind of process about in your life? And I know it’s not a finished thing. It’s a continuing thing. But what’s helping you begin to release to God the things that need to be released, fold your hands in prayer about those things, and yet maintain responsibility over the things you can control? Shannon: I think sometimes it helps to think about: Okay, which category does this fit in? Is this something that I do have influence over? Is this something where I can take responsibility for part of the situation? And which parts do I need to put into that other category and surrender control to God? Can I talk a moment about parenting? Shannon: Because I think that’s always what comes out of these conversations: What about kids? Because I think, good moms, we do take control of our children. So what I like to say with parenting is: When you get that new little baby from the hospital, you do have a lot of influence over that baby. Shannon: But by the time they’re graduating, you’re mostly folding. Shannon: Praying like crazy, yes! I have a daughter who’s a freshman in college, and, oh my goodness, I’m spending a lot of time in prayer for her. But all of those years in-between, from birth to eighteen, all of those years, they’re spent transferring from holding to folding. It takes so much wisdom in the little situations in life to know: Is this something . . .He wants to pick out his own clothes at seven years old—is this something that I should be holding responsibility for or folding in surrender to God? Another little way that I say to think about is: If you can still hold your child in your lap, you should mostly be holding. If you can’t hold your child in your lap, or they’re too independent to want to sit in your lap, then you’ve got to really get to work on folding your hands in surrender. Nancy: Which doesn’t mean you advocate as a parent. Nancy: I’m thinking of a sister with five, now, young-adult kids. But as those kids were little and teenagers, and now, even as young adults, there are a lot of situations where . . . We were on the phone last night late. And she’s saying, “In this situation with this child, or this situation with this child, how much influence do I bring to bear as a parent?” And that takes a lot of wisdom, and where does wisdom come from? Shannon: Oh, from the Lord. Nancy: It comes from the Lord. And this whole thing of meditation on the Word of God. Nancy: Talk about how that enables us to deal with this surrender in the appropriate moments and yet the holding on to responsibility when we should. Shannon: I think that surrender is only possible when we’re reminding ourselves what is true about God because if we’re convinced that He doesn’t see us, that He doesn’t care about us, that He doesn’t have control, are we going to give Him control? No! We’re going to . . .
Nancy: . . . fight for it. Shannon: Yes. We’re going to try to maintain control. But I think that meditating on what is true: The fact that God is in control, that He does see us, that He cares deeply about the details of our lives, by meditating on what’s true, we posture ourselves. We prepare ourselves for facing the things that we’re going to have to face in the next twenty-fou hours or the next twenty-four years, whatever it may be, the things that we will face that we can’t control. And so I think we have to go into life, whether it be in the morning, or as we progress through life, we have to prepare ourselves mentally and spiritually and emotionally by meditating. Meditation builds a bridge between what we say we believe and how we actually live. Shannon: Because how many times do we say that God is in control and yet live like we’re in control? We’ve already talked about that. So meditation helps to wear these new grooves into our mind, so when we face something we can’t control, our heart more readily flies to the truth, and we’re able to remind ourselves: You know what? I just reminded myself this morning that He loves me. He sees me. He’s got control over the intricate details that I’m facing in today’s activities. And . . . I can trust Him. Nancy: If we were to talk to your husband, and we were to ask him: Describe Shannon when you were early married and how this control issue expressed itself in your home, and now twenty years later, how you see Shannon responding to circumstances—and I know it wasn’t all bad then, and it isn’t all good now—but how do you think he would describe the transformation that God has been bringing about in your life? What looks different? Shannon: Well, for one thing, I’m inviting him more into that process—my husband and God. Shannon: I think I’m a little bit more relaxed about my ideas of how everything should go in our family and our home. I’m a little bit more willing to adjust according to what my husband thinks—about how we should spend the weekend, or how we should spend our money, or how we should raise our kids. Nancy: Which doesn’t mean you don’t interact with him on that. Nancy: Because I’m thinking some people might be envisioning: You’ve surrendered control, and now you have nothing to say and no opinions. That doesn’t sound like Shannon to me. Shannon: That would be really hard for me! Nancy: And it’s not even, really, what God’s asking for. Shannon: No, He isn’t. I’m never suggesting that a wife should not give her suggestions or her input to a husband. Nancy: So how do you do it differently now? Shannon: I think prayer—begin with prayer. And maybe not so much talking. Maybe suggest it once, and wait a little while and bring the conversation back to it. I remember as a young wife earlier in our marriage, I had started talking to my husband about our kitchen. I felt like our kitchen was too small. Nancy: You and a few other women. Shannon: Probably. I had a solution for this: I thought we should build an addition on to the back of our house. When we first moved into this house, I told him it was my happily ever after house, and now I was telling him it was my happily ever after the addition house. So I was talking, talking, talking about the addition, probably on a daily basis. I was drawing pictures of the addition, and I was just adding on to it with different details and everything. And so I thought, Okay, this is good. At least we’re starting. But the whole number of years thing, that needed to . . .
Nancy: . . . be shortened. Shannon: Yes. Be shortened. So I was looking for ways to propel this plan forward. We started saving money on a yearly basis. And about three years into saving, we got this unexpected gift in the mail from my husband’s parents. And then, within another couple of days, we got an unexpected tax return. And then my husband got a bonus. All within the same week. And, amazingly . . .
Nancy: They all had marked on it: For the addition. Right? Shannon: I wish! I was thinking, This is providential. Because, when you added those three checks together, they exactly made up for what was still lacking in our little fund. So I’m thinking in my little mind, Oh, apparently he doesn’t know I can add! I already had this all figured out. So we get out for dinner, and he’s sitting across the table from me, and he’s got this big grin from ear to ear. And I’m thinking, He’s about to tell me, “We can do the addition.” I had almost called the builder before we went out for dinner but decided to hold off for a little bit. So he slides this spreadsheet across the table, and I said, “Oh, what’s this?” And I pick up the paper, and I’m kind of reading, and there’s all these different: Missions and ministry organizations and non-profits. And there’s all these numbers beside them. And I’m thinking, Those are pretty big numbers beside there. And I start scanning the page. My heart’s sinking. I’m looking for the addition on the page, and there it is way down on the bottom with the smallest number beside it, the same number from last year. Nancy: So he’s planning how to give this money away. Shannon: He was. And when I looked back into his eyes, I could tell two things: First of all, he had not even considered this money for the addition. And second, he had no idea I was completely counting on it. So this was a moment. Was I going to be a sweetly surrendered wife? Maybe I could give my input. Or was I going to be the control girl? We always want for God to lead our husbands and to use our husbands, and ordinarily I would say that. I want my husband to hear from God. And I love the fact that he has the spiritual gift of giving, and he delights in giving. But at that moment, I didn’t want him listening to God. I wanted him listening to me. Shannon: That’s a dangerous place to be as a wife. So many times we feel like we can do a better job of taking command, taking the steering wheel for our families. Nancy: Now, it wasn’t wrong for Adam to listen to his wife. Nancy: Except when God was trying to tell him something different, and she was contradicting the voice of God. Shannon: Yes. And we see it again in Sarah’s story. The phrasing is almost identical. Abraham listened to the voice of Sarah, and it’s reminding us of what Adam did with Eve. Nancy: And got into a really complex, hard situation. We’re going to talk about that in the next program. I want to know what happened in your husband’s heart and eyes and spirit when you responded that way. Shannon: Oh, he kept saying, “Babe, I thought we decided we were planning for this addition?” He was stunned. He’s such a sweet, gracious man. He didn’t get angry back. He let me cool off. I remember the evening kind of ended with me being angry and terse and silent and slamming doors. It took me a few days. This was something I wanted so badly! I committed before the Lord that I would not bring up the issue of the addition again. He already knew what I wanted. Nancy: God and your husband both knew. Shannon: Yes. The Lord and my husband. Ken already knew that was the desire of my heart. I just purposed before the Lord I wouldn’t bring it up. And so I went on Realtor.com, and I started looking for our neighborhood, our community. I found one house that matched the criteria in our school district, and that’s the house we moved into. And we have a very comfortable home. Our kitchen’s not enormous, but it’s bigger than it was. And God has so blessed me every time that I let my husband lead, every time that I choose to surrender. I didn’t want it any less, but God shaped my heart, and He gave me contentment. And that’s what He does when we surrender to Him. He gives us hope. He gives us security. He gives us contentment. And He restores our relationships. He brings the peace, the joy that we’re hoping for when we try to take control. He gives us all those gifts when we do the opposite of taking control and we surrender. Nancy: And surrender is what it’s all about. Surrender is what transforms our relationship with the Lord, with ourselves, with others. This thing about control and surrender, it’s not just for wives. It’s not just for moms. And it’s not just for women. Shannon: Yes. Take your hands off. Nancy: I don’t always do that. I still have some of that pit bull in me at times. And now that I’m married, it’s coming out in different ways. But I find when I’m the pit bull, I make myself and everybody else around me really unhappy. I don’t get the end I’m hoping for, that great happy ending. But when I take my hands off, and I trust God to be God, and I trust God to work in my husband’s life, in the ministry, in our staff, in my future, and all of this, it’s amazing what God can do and will do when we let Him. Shannon: Yes. And the transformation that takes place when that’s our demeanor. We don’t need some huge life event to be transformed. We just need this situation, this day, these kids, this husband, this messy kitchen, this moment. This is where the transformation from trying to take control to being a woman who’s sweetly surrendered to the Lord. This is where it takes place. Leslie: We’ve been listening to a conversation between Nancy DeMoss Wolgemuth and Shannon Popkin about trusting God to control our lives. That includes encouraging husbands to lead. Shannon talks more about that in her book, Control Girl. We’d like to send a copy when you support Revive Our Hearts with a gift of any amount. The number is 1–800–569–5959. Ask for Control Girl when you call, or visit ReviveOurHearts.com. You can see a video our team shot with Shannon Popkin at ReviveOurHearts.com and share it with friends who would get a lot out of this message. I hope you’ll check it out at ReviveOurHearts.com. And one more important note related to videos, be sure to join us for the free livestream of the Revive ’17 conference starting tomorrow. For all the details on joining us for this live event, visit ReviveOurHearts.com. Today we talked about the importance of following when your husband steps out to lead, but what if he’s passive and doesn’t lead? Shannon and Nancy will be back tomorrow to talk about that. Please be back for Revive Our Hearts. Revive Our Hearts with Nancy DeMoss Wolgemuth wants to help you promote peace in your home. It’s an outreach of Life Action Ministries. Next Program What About My Passive Husband?